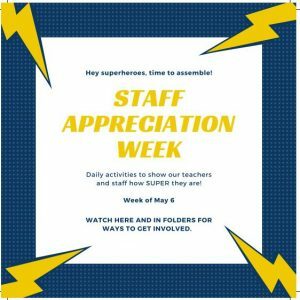 Ames Teacher Appreciation Week is around the corner. This exciting week allows students and parents to show how much we appreciate all the Ames Teachers and Staff do for our children and community. Each year we create a week of exciting events and treats to say THANK YOU! In the past, we’ve delivered Starbucks and surprised them with a Teachers Lounge Takeover filled with fun treats. The week culminates with a delicious luncheon for the entire Ames staff where we raffle off baskets. Each teacher will also receive a special gift accompanied by thoughtful notes from students. – Join us for the luncheon on Thursday, May 9. – Create a gift basket to be raffled at the luncheon. – Donate towards the week activities which included teacher gift cards, luncheon and other events. More details and sign up links to come next week. Raging Waves "Plunge into Fitness"